You don't need exciting growth stocks to get great returns. Here's proof! Your aim, as an investor, should never be to emulate the photo above. One of the biggest mistakes new investors can make is to think of the stock market as an exciting, adrenaline-pumping endeavor. While there will be days that provide huge emotional swings, the real key to building wealth over time lies in picking great companies and holding them for decades. That's why, for this article, I'm highlighting three very simple, unexciting stocks that have quietly tripled value for shareholders since August of 2011. This includes cigarette-maker Altria (NYSE:MO), grocer Kroger (NYSE:KR), and health-insurer United Health (NYSE:UNH). You wouldn't have found any of these companies being hyped as "The Next Great Growth Stock" five years ago, and you still wouldn't today. But there are a few key traits that have helped them outperform. Go to a stock screener, look at these three companies, and you'd call me a liar for saying that all three have tripled. Indeed, since early August of 2011, none of these companies is up over 200%. But there's a key ingredient missing here: dividends. 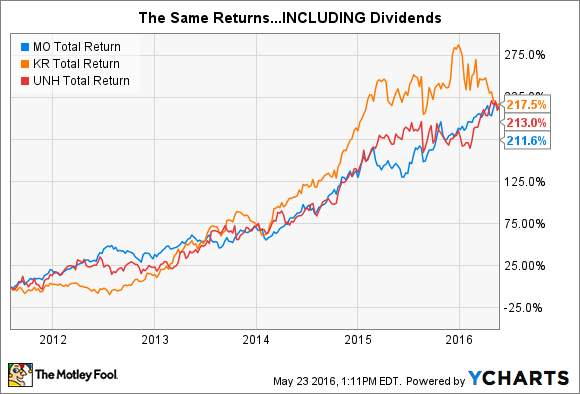 To summarize Motley Fool writer Morgan Housel, calculating returns without including dividends is like evaluating football's greatest quarterbacks without considering their post-season performance. Imagine how much more mundane Joe Montana would seem without his four rings. It's an incomplete picture. For truly patient, buy-to-hold investors, buying dividend stocks is a cornerstone of wealth-building. The second major aspect of all three companies shares is that they had competitive advantages that allowed them to continually improve their businesses. Kroger was a run-of-the-mill grocer five years ago. Around that time, it made a string of acquisitions that gave it a heavy presence in the natural/organic movement. Key among these acquisitions were Harris Teeter and Roundy's Mariano's Fresh Market. But its most important advantage is that it has over 2,700 locations nationwide. By renovating existing stores, introducing an in-house organic brand, and offering more natural food options, Kroger was able to offer healthy food at convenience due to its number of locations. Customers who may have had to travel to reach a Whole Foods now have access to organic food choices more locally. Altria's prime advantage came from its key brands, chief among them Marlboro. The company currently controls just over half of the U.S. cigarette market. That kind of brand power allows the company to continually bump up the prices of its cigarettes, if ever so slightly, which compound over time. Unitedhealth's prime advantage also came from market share. Back in 2010, the company had over 84 million policyholders, representing a 13.9% market share. The next closest competitor at the time -- Anthem -- had a much smaller share, at 8.3%. The company has maintained that lead, while Anthem has since fallen behind and yielded its No. 2 spot to Kaiser Permanente. 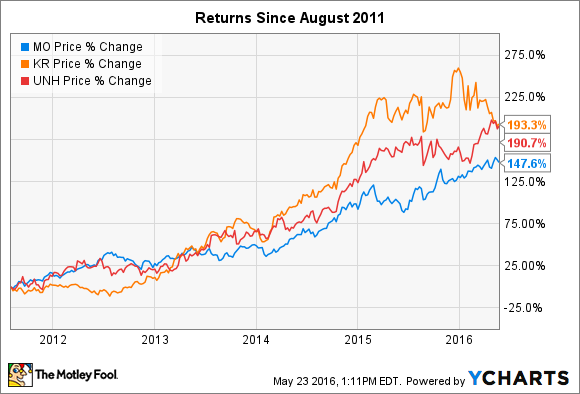 One of the keys to great returns is the fact that all three of these companies were fairly valued five years ago. Part of the benefit of buying shares in an older, more established player in a 'boring' industry is that you don't have to pay much of a "hype premium." Back in August of 2011, all three of these companies were fairly cheap. When you put all three of these variables together, you have a recipe for outperformance. That's not to say there isn't a spot for exciting fast-growers in your portfolio as well. There's almost always a balance you can strike in your portfolio that allows for a mix of exciting, volatile stocks and the more boring plodders that let compounding do the heavy lifting over time.